It's given voice to a new silent majority--and made a few enemies. Now what? This year, MoveOn turns ten. News of the organization’s advanced age tends to elicit the same startled response as word of a childhood star’s divorce. But more important, the anniversary serves to highlight just how far the organization has come. What started as a simple one-sentence petition hastily posted to the web has evolved into the most readily identifiable group in the vanguard of a revived progressivism, with a membership that exceeds 3 million. Capable of dominating a news cycle with a single ad and raising millions of dollars with a lone e-mail, MoveOn pioneered an entire approach to conducting politics through the Internet that has been replicated and spun off across the country and around the globe, an approach that, as the Obama campaign has dramatically demonstrated, has permanently transformed the landscape of American politics. And yet the roots of its success remain largely misunderstood. Forty years later, despite tectonic shifts in demographics and politics, our political map still bears the same key: a decent silent majority on one side besieged by a zealous, angry, out-of-touch left on the other. For movement conservatives and establishment centrists alike, MoveOn is just a new name for an old foe. Bill O’Reilly has called it “vicious,” “radical,” full of “fanatical left-wingers” who are blackmailing the Democratic Party. John McCain, not to be outdone, responded to the “General Betray Us” ad by telling a Republican audience this past fall that MoveOn “ought to be thrown out of this country.” Ostensibly mainstream voices like CNN’s Campbell Brown have referred to MoveOn as “American insurgents,” while Peter Beinart, in a 2004 cover essay in The New Republic, suggested that MoveOn be purged from the center left just as communists once were. Democrats have gotten in on the act as well: Hillary Clinton told donors at a private fundraiser that MoveOn had “intimidated” her supporters in the caucus states, and Barack Obama took a veiled swipe at the group in his recent speech on patriotism. As Tracy’s experience shows, the MoveOn model of simplified and accessible activism has proved enormously successful. But as the organization enters its second decade, there’s evidence that it’s reached a point of diminishing returns. In the run-up to the Iraq War, MoveOn’s membership exploded, from 600,000 to 1.6 million, but its rate of growth has slowed considerably since then. What’s more, the organization faces a challenge in navigating the emerging political landscape. Born in opposition, first to the Republican impeachment effort, later to the Iraq War and the Bush agenda, MoveOn may soon be forced to define its relationship to a government controlled by its supposed allies in the Democratic Party–at a time when the party’s progressive base is increasingly frustrated about its failure to deliver the change it has promised. They sent an e-mail to 100 friends with a link to moveon.org. A September 24, 1998, article in the San Francisco Chronicle, Net’s Role in Scandals May Alter News Media, mentioned the effort in its final paragraph, noting that the site had attracted 500 signatures in its first day of operation. By the end of the week, that number was 100,000. “Essentially we stepped into a vacuum of leadership, and we said something sensible,” recalls Blades. “We’re the quintessential accidental activists.” They figured the petition would be a one-time endeavor, but when they saw the reaction they knew they were onto something. “I still remember one of our early e-mails: a woman wrote in and said, You know, I’ve never done anything political. I’m a single mom. I get home and feed my son. This”–meaning signing a petition, forwarding an e-mail–“is something I can do.” This ease of use remains one of MoveOn’s hallmarks, one with particular appeal at a time when Americans work more than their counterparts in almost every other industrialized nation. It’s worth pausing for a moment to note the complete lack of ideological zealotry in MoveOn’s founding. “It was really more about common sense versus insanity than it was about progressives versus conservatives,” says Ben Brandzel, who worked for MoveOn and now consults with other groups around the world using the same model. “Impeachment, the details of that, really has nothing to do with any political scientist’s idea about progressive or conservative,” he says. It wasn’t until the shock of 9/11 and the run-up to Iraq that MoveOn’s “basic common sense populism [was] grafted onto a partisan divide,” according to Brandzel. The vessel for this shift was an unassuming 6-foot-3 20-year-old named Eli Pariser. As MoveOn PAC’s executive director, Pariser, now 27, is the organization’s de facto leader, and his reserved bearing is rather stunning if you’ve spent any time listening to Bill O’Reilly. In a wedding announcement in the New York Times this summer his new wife described him as “clear-eyed and hopeful.” In person, he’s so preternaturally calm one almost feels he might be some kind of reincarnated lama. “By Monday there were thousands of e-mails in my Inbox,” he told me recently. “The server was crashing. It was this moment where the e-mail had hit a chord and was being repeated out through the address books.” Within the first two weeks, 515,000 people signed the petition, and before long he’d connected with Blades and Boyd, merged his list with MoveOn’s and joined the organization as a full-time staff member. In theory that’s all well and good; in practice, it’s no small task to figure out just what kind of choices 3.2 million people are interested in making. In his new book Here Comes Everybody, Internet theorist Clay Shirky illustrates how dramatically the Internet has lowered the cost of collective action and coordination across barriers of time and space. MoveOn’s approach to activism–mass e-mails, instant internal polling, distributed fundraising–takes advantage of this development. Before MoveOn pioneered the online petition, just the simple act of gathering 100,000 signatures would have cost hundreds of thousands of dollars and hundreds of hours of labor. Now MoveOn sends out e-mail petitions several times a month. Or consider this: to manage its lobbying efforts and programs for its more than 4 million members, the NRA has a staff exceeding 500 and a $15 million, 390,000-square-foot office building in Virginia. MoveOn has a staff of… twenty-three. And no headquarters. Twice a week, a dozen of MoveOn’s staffers call in from around the country for a strategy session. The organization is so committed to the ethos of the virtual office, it has an internal policy that even when staffers are living in the same city they’re prohibited from sharing office space. “What makes it possible,” says Ruben, “is that every action taken ends up in our database. It’s all in one place and the data set is enormous, which if you’re a geek is awesome.” When MoveOn sends out mass e-mails, staffers often first test multiple separate subject lines within small sample groups, choosing the subject that’s most effective at getting people to act on the e-mail’s “ask.” Each week they run a tracking poll, surveying a random subsample of members to identify which issues they’re following and where their passions lie. The speed and efficiency of Internet communication allows the organization tremendous flexibility in responding to breaking developments. “Because we are member driven, we ‘Chase the Energy,'” Brandzel writes in a manifesto called “The 8 Fold Path,” which lays out the MoveOn approach. “Energy flows with news cycles, and the opportunity to make a difference.” In the wake of Hurricane Katrina, MoveOn was able to use its member database to set up a website where evacuees could be matched with members who had extra rooms in their houses to share. The site was up just seventy-two hours after the hurricane made landfall in New Orleans, and ended up providing housing to more than 30,000 evacuees, a response far quicker than FEMA’s. MoveOn-ers are quick to point out that technology is just the means, not the end. “The Internet’s just a tool,” says Brandzel. “I mean, would you call a church a paper-based organization because the Bible is printed on paper?” Just as the Reformation required both discontent with the Catholic Church’s corruption and Gutenberg’s printing press, MoveOn’s rise required both the swelling backlash against post-Gingrich radicalism and the explosive growth of the Internet, particularly among the ranks of the professional classes with Internet access. Somewhat frustratingly, MoveOn does not keep demographic information about its members, which makes it difficult to know for sure whether the sample of members I spoke with, mostly white and middle class, is representative. But it is clear that they aren’t radicals. After the 2004 election, MoveOn attempted to use Internet forums, e-mails and polls to build a platform of sorts, called the Positive Agenda. The results were squarely within the mainstream of the Democratic Party: universal healthcare, clean renewable energy and the restoration of the Constitution and civil liberties. “The idea that MoveOn is like some foaming-at-the-mouth, swinging-from-the-trees liberal interest group is kind of a joke,” says influential blogger Jane Hamsher of FireDogLake.com. “People ask us all the time, you know, Make your members do this or think this,” says Pariser. “We just have to politely say, We can’t. Even if we wanted to, people click the link or they do the thing that we ask them to if they think it’s a useful thing to do. There’s no chain of command. It’s a revealing analogy. In many ways MoveOn’s relationship to its members looks a lot like a business’s relationship to its customers. If a product isn’t selling, they take it off the shelves. For activists rooted in an earlier generation of social movements, which tended to prize long, disputatious meetings and the unwieldy process of forming bottom-up consensus, this approach is at best alien, at worst insidious. Customers, after all, aren’t part of the creation of the product: they’re not running the meetings where new packaging is designed; their input is limited to the final result and expressed through the transaction of purchase. And the role of customer imposes no obligations. You are free to buy or not buy, or in MoveOn’s case, sign the petition or not sign the petition. Oscar Wilde once complained that the trouble with socialism was that it took “too many evenings.” MoveOn holds out the promise of progressive change without the evenings. Marshall Ganz–who organized with the farm workers, recently ran training workshops for Obama’s field staff and now studies and teaches organizing at Harvard’s Kennedy School–says much of what MoveOn does is marketing, not organizing. “The genius of the Internet is more the way it can create a marketplace than create organization,” he says. “It’s important to distinguish between sharing information and forming relationships. Forming a relationship, we make a commitment to work together. Participation in democratic organizations is not just an individual act. It’s an act of affiliation with others.” If you were to map the arrows of relationship between MoveOn’s staff and its members, Ganz points out, nearly all the arrows would run between the members and the staff: you receive an e-mail, you respond, you give money, etc.–but relatively few go from member to member. Talk to MoveOn staff members and they’ll say that any method of organizing has its limitations. The organizing model that requires long meetings and vigorous debate can lead to organizations being driven by, in MoveOn spokeswoman Ilyse Hogue’s words, “the loudest person in the room,” something that cuts against MoveOn’s non-shouter ethos. They’ll also point out that their approach has led to concrete victories: they spearheaded an effort that blocked the FCC’s attempts to allow media cross-ownership in local markets; they were an instrumental part of the campaign to beat back Social Security privatization; and the “caught red-handed” ads they ran in targeted Congressional races in ’06 had a real effect in softening support for a number of Republican incumbents. What’s more, the model works well enough that people around the world are eager to adopt it. In Australia, a MoveOn-type group called GetUp!, which was advised by Brandzel, played a key role in the recent electoral victory of the country’s center-left Labor Party. Last year James Rucker, a former MoveOn staffer, started ColorofChange.org, a MoveOn-style organization focused on African-American political mobilization that now boasts 100,000 members; Avaaz.org, a global justice MoveOn spinoff, has a worldwide membership of more than 3 million members. Meanwhile, technology moves fast and MoveOn’s primary medium, e-mail, threatens to become outmoded as young people migrate to text messages, social networking sites and IM. In response, MoveOn has branched out to conduct Facebook activism, successfully running a campaign within Facebook to force the site to alter a feature that broadcast private purchasing decisions. 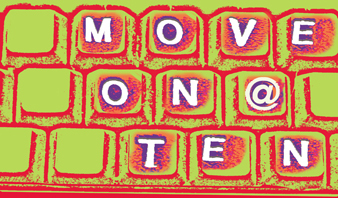 MoveOn began developing the capacity of offline action in 2004, attempting to build from scratch in a little more than ten weeks a member-based field program in support of John Kerry in swing states. The idea was that MoveOn members would act as precinct captains and canvass their neighbors. Though rushed and somewhat ad hoc, this first foray into concerted offline activity gave birth to Operation Democracy–since renamed MoveOn Councils–the locus of MoveOn’s local, physical presence and the conduit for everything from phone banking to house parties to war vigils. Anna Galland, who heads up the councils for MoveOn (and who is, full disclosure, a college friend), says they’re ambitiously scaling up. “We’re up to 250 local councils, with councils in every state.” Members meet in their local councils, and council leaders report to volunteer regional coordinators. “People come from all sorts of backgrounds,” says Galland, and get trained in everything from how to run a meeting to leadership development. “We’re not just looking for volunteers; we’re trying to build a culture of organizing,” she says. The councils were born of a desire to help elect Kerry, and now that Obama is the presumptive Democratic Party nominee, nearly all of MoveOn’s focus has shifted to getting him elected. In many ways, the Obama campaign is built on much the same aspirations, ethos and constituency as MoveOn, which is why it wasn’t particularly shocking that when the group polled its members in February, 70 percent voted to endorse Obama over Clinton. Particularly egregious to Benjamin and others was the failure of Americans Against Escalation in Iraq. Co-founded in January 2007 by MoveOn and run by its then-Washington director, Tom Matzzie, the coalition spent $12 million attempting to force Bush to begin withdrawing troops from Iraq. Its efforts helped push Congressional Democrats to pass a supplemental bill that tied funding to a withdrawal timeline. But after the President vetoed the bill, AAEI focused on running ads against Republicans who’d backed the White House rather than trying to force the Democratic Congressional leadership to cut off funds. If CodePink thinks MoveOn is too cozy with the Democrats, Democratic staffers on the Hill have a hard time telling MoveOn and CodePink apart. Several staffers I talked with felt animus toward MoveOn for organizing actions against their bosses. But when they described these actions–sit-ins in their Hill offices, for instance–it became clear they were confusing MoveOn with CodePink and other more confrontational antiwar groups. The resentment is also a result of MoveOn’s clumsy Betray Us ad, which became such a high-profile distraction that it allowed conservatives to deflect attention from the war debate. And MoveOn’s presence on the Hill, where the battle over escalation was fought, is not particularly strong; in Democratic Congressional offices, it’s viewed more as an annoyance than a force. “I’ve never been in a room where someone says, Let’s all check with MoveOn,” said the former staffer. “Of course, I wish the result had been different,” says Nita Chaudhary, MoveOn’s chief antiwar organizer, of their efforts to prevent the escalation. “But we tried very hard.” Chaudhary points out that MoveOn has spent time and effort going after Democrats. Local groups routinely meet with their Representatives to lobby them on the war, and “we ran ads against Democrats–we did this whole backbone campaign with Democrats, trying to get them to stand up against a blank check on the war.” But she concedes that the organization made a tactical decision that the best way to bring the war to heel would be through elections, first electing a Democratic majority and now trying to elect Obama along with an “anti-Iraq War majority” in Congress. Should the Democrats retake the White House and add to their Congressional majorities this fall, they would do well to take note of Tracy and the millions like her. Come next spring, if they haven’t started withdrawing troops, you just might see Sandy Tracy in the streets with a bullhorn.